We boarded VIA HEP-1 Coach #8120 but that's really an afterthought as just minutes after departing Schenectady on time at 11:29am, my friend and I went straight to the dome car! The dome car on this train was a Park series car that runs normally on the VIA train "The Canadian" and sometimes "The Ocean". These cars are named after national parks in Canada with this one named "Evangeline Park". Now the VIA equipment was only running between Albany-Rensselaer and Montreal because the retention toilet tanks on the coaches were so big that they wouldn't have enough clearance over the third-rail electric apparatus that is used on Metro-North Railroad when the train is heading into New York City. There was also a concern that the dome portion of the dome car would be too close to the overhead wires in the tunnels leading to Penn Station so for those reasons, this equipment would not run all the way to New York, rather, passengers would have a cross-platform transfer at Albany-Rensselaer from the normal Amfleet-equipped train to this one. As I said earlier, Amtrak did have a press release about this equipment running but either few people on the train knew there was a dome car on it, or they didn't care as there were seats available the entire time my friend and I were in the car. Several of us had DSLR (Digital Single-Lens Reflex) cameras and were taking lots of photos looking out over the train going around curves and past signals and such. The next stop for the train would be Saratoga Springs, NY where we arrived at 11:56am. I could see railfans on the platform with cameras mounted on tripods and a good sized crowd was boarding here. Saratoga Springs Station is the southern terminus of the Saratoga & North Creek Railroad which is owned by Iowa Pacific Holdings. Their equipment, including dome cars as well as an EMD BL-2 were all stored at the station there. We departed Saratoga Springs at 12:01pm, running 4 minutes late. I noticed that there are several small yards along this route which is the former Delaware & Hudson, now owned by Canadian Pacific Railway. Norfolk Southern also operates several trains on this route via trackage rights. I noticed also that the dome section of this car was probably not designed for tall people (I'm 6'2") as I bumped my head a few times on the ceiling but no big deal, I eventually got used to it! There was lots of lively conversation among passengers as we continued northward. We all had great conversation about how wonderful riding in a dome car is! We would pass Fort Edward Yard before arriving at the next station stop of Ford Edward, NY where we arrived at 12:22pm. The stop was very brief as we departed at 12:23pm running 4 minutes late. We were now riding along the southern end of Lake Champlain. This route is by far, one of the most scenic Amtrak routes in the eastern half of the country! Amtrak sends its "Great Dome" car to run on this train during the peak fall color season since there's so much to see on this route! So if you weren't able to ride on one of these trains with the dome provided by VIA, you have a chance generally each year in the fall to ride Amtrak's only dome car on this route as well. We made our next stop at Whitehall, NY at 12:57pm, and departed at 12:58pm having lost some time, now down 14 minutes but overall, no big deal. The train was now riding through rock cuts along the route and the land was getting more mountainous as we were riding through the Adirondack Mountains along the shore of Lake Champlain. Even without the fall color, there's still so much to see as I had taken a lot of pictures! The next stop would be Fort Ticonderoga, NY where we arrived at 1:31pm and departed at 1:32pm running 15 minutes late. The way my itinerary was set to work, was that I would get off at the next stop of Port Henry, NY and wait 25 minutes for the southbound Adirondack to bring me back to Schenectady. Apparently, I wasn't the only passenger who had this idea! Several of us in the dome who were doing the same thing I was, trying to make a single-day round trip on this train, would be getting off in Port Henry so as to catch the Southbound train back! Another passenger onboard who was a private car owner himself kept me up to date with where Train #68, the southbound Adirondack was since he had cell phone service at that point, something that was fading in and out due to being in the Adirondack Mountains. I bought a quick Diet Pepsi in the galley under the dome that was being used as the "cafe car" shortly before arriving at Port Henry. 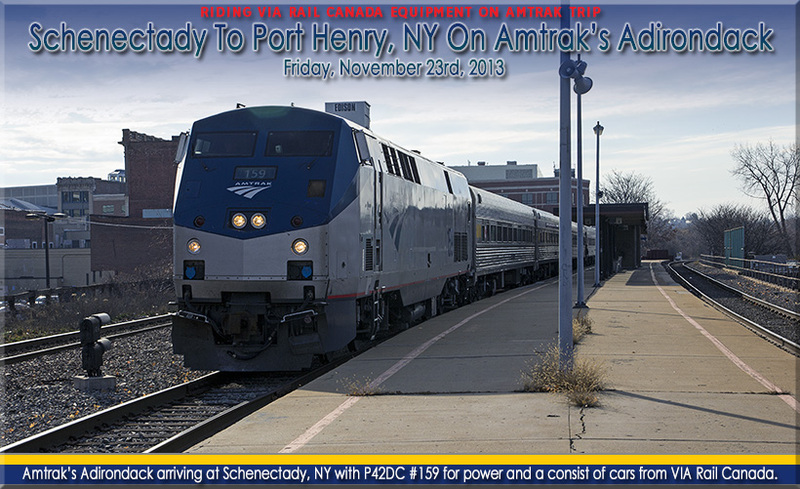 At 1:52pm, we arrived in Port Henry, NY having made up a couple minutes, running 13 minutes late. I took roster photos of the train just after it departed and now, all we had to do was wait for Train #68 to arrive. The station in Port Henry is not staffed, so you would need to buy a ticket onboard from the conductor if you don't have prior reservations. It features a small station building that has train information on display about Amtrak's Adirondack. The station building was built in 1888 which makes it one of Amtrak's oldest stations. Also on display at the station is a train lettered for the Lake Champlain & Moriah Railroad. The locomotive is an MLW RS-18 (Montreal Locomotive Works was a subsidiary of ALCO) #20. There is also an old 2 bay hopper car and a caboose on display as well. During our layover in Port Henry, myself and a few other passengers had some nice conversations about trains and owning private cars. Well, as I'm sure you figured, I took a ton of pictures on this leg of the trip. The best of the best can be found by clicking the link below, so pour yourself a glass of your favorite beverage and enjoy the next set of pix!! !